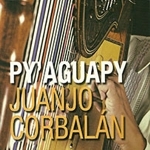 Recorded in March 2014 in JVA Studios, this is the first album by Juanjo Corbalan as soloist with his own compositions and tunes of other contemporary authors as well as some traditional paraguayan harp music. In this album Juanjo displays his very own style which gather all the influences of his musical career. Fresh instrumental combinations enhance the expression of his compositions and testify the versatility of music for and with the Paraguayan Harp.